The conclusion of 2014 is upon us, and it's time to look back at the year, and think about all the cards I added to my collection over the past 365 days. Card wise, it was a very good year. Everything else, not so much, but as always, cards provide a much needed respite from the bad things happening in "real life". I had set a goal that 2014 was going to be better than 2013 for my hobby, and it was. I was able to bring in a lot of new cards- 4,937 total, my best year since 2004, when I got over 10,000 new cards. December ended up being the month that saw me get the most cards - 812 - led by 243 on Christmas, and several trades that saw me get over 300 cards combined happen during the month. (Having an actual tradelist really does help!) The month of August was the worst, I got only 81 cards the entire month- no coincidence that it was the worst month of the year in "real life" as well. The new people does not include all the baseball, football and hockey players, only NBA and NASCAR. The new sets total DOES, however, count the baseball, football and hockey sets. and I also figured out, I think, the 10 sets I got the most cards of during 2014. 2014-15 Hoops, 343 cards. I did a hobby box, which is rare for me these days. Most of my new cards come to me from retail. 2013-14 Hoops, 238 cards. I'm a big fan of the Hoops sets. I didn't do a box but I did lots of retail. I'm still missing the Elton Brand card though, looking like the last one Panini will produce of him. 2013-14 Panini, 236 cards. My family gave me a hobby box of this one to celebrate 1 year of my not dying. (I have mentioned 2013 was not a good year!). I came up 4 cards short of the 200 card set, but I got them later, and some inserts. This one also appears on the completed sets chart. 1989 Donruss, 235 cards. A baseball set. With bright orange card backs. These also came to me as a gift. 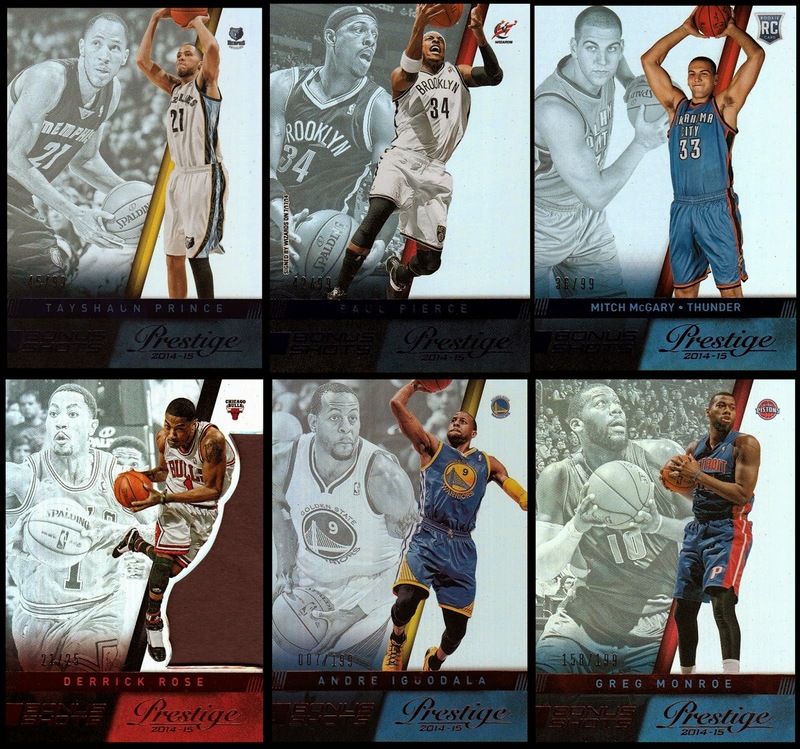 2014-15 Prestige, 174 cards. I was actually surprised to see this set ranked so high. This does not include the Prestige Premium cards I got at Christmas, either. The Prestige set is only 200 cards, but there are quite a few inserts, so I'm not at 75% completion just yet. 2014 Topps US Olympic Team & Hopefuls, 148 cards. I did a hobby box of them, and completed the set. It was, in fact, the first set I completed in 2014 and my first Olympic set completed. Each pack gave two parallels or one parallel and one insert, thus how I was able to get 148 cards. 2012-13 Panini Brilliance, 122 cards. I was going online to look for a price on the Olympic box, and saw these were on sale for less than half price, so I had to get a hobby box. More on this set later. 2014 Press Pass, 91 cards. It's hard for any NASCAR sets to make the top 10 because they refuse to make decent sized sets. The set is only 100 cards, and inserts and parallels were down for the set. I did complete the set, but I also got some of them in 2013, as the next year's set is released around Thanksgiving time. I've already got more than 60 of the 2015 cards. 1995 Traks 5th Anniversary, 89 cards. I had only one card from the set, and was able to score a hobby box on Ebay for $10. It's only an 80 card set but there was one insert set. Figuring out which people I got the most of was a little harder. 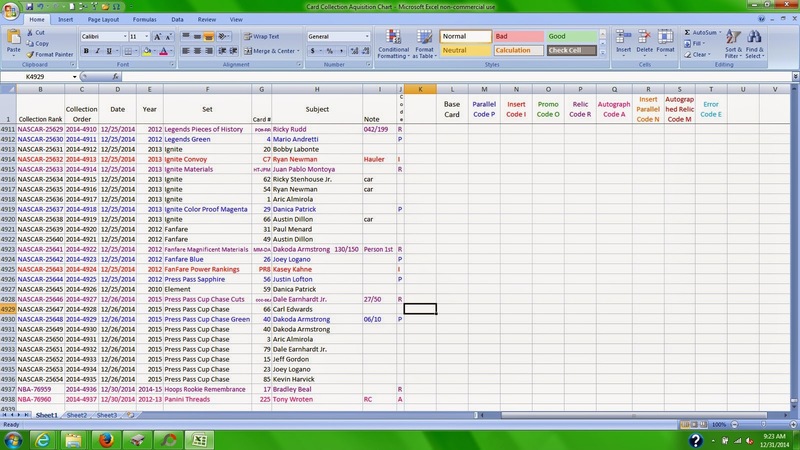 There are a lot more options for people, but with Excel it was not hard to figure out at all. In 27 years in the hobby, this is the first year I know any of these records that I'm posting right now, because I never fully documented before. Interestingly, while the NBA sets dominate the set leaders, NASCAR dominates the person leaders. This is mostly due to the fact that Press Pass issues very short sets and about half of each set is composed of 2 or 4 redundant subsets. 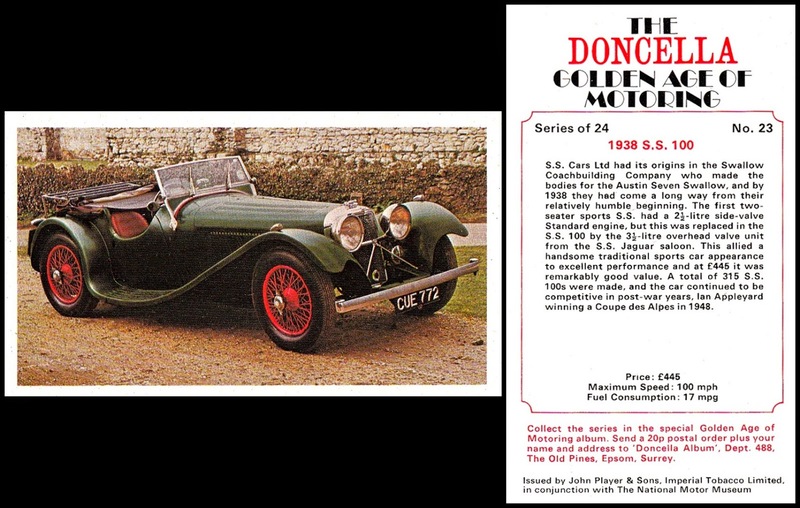 I have included the few cards of cars in the listings. Totals do Not include cards shared with other people. 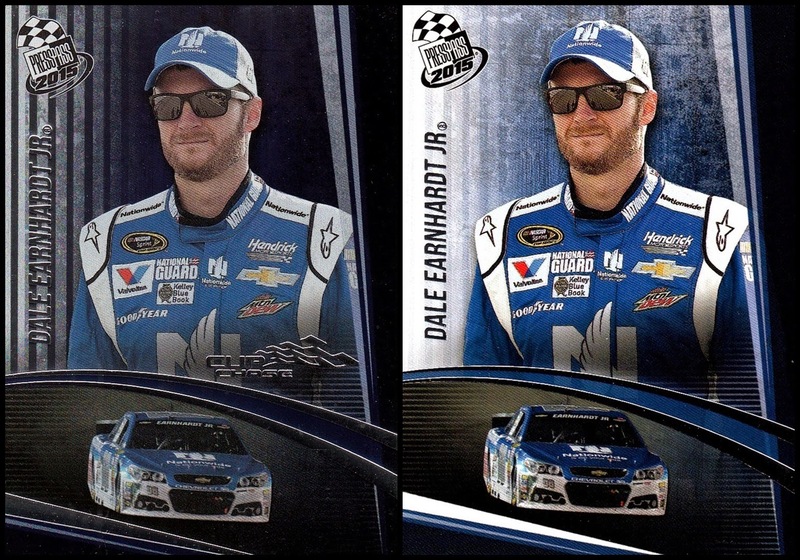 Dale Earnhardt Jr., 45 cards. Not a surprise that Dale Jr. leads the way. He has the third most cards available of any NASCAR driver, and will likely pass Mark Martin in that soon. Jeff Gordon, 32 cards. Jeff has the most cards available of anyone in NASCAR history. TIE- Kobe Bryant and Kyle Busch, 28 cards. Kobe is the highest ranking NBA player, and only ranks this high because of the Kobe Anthology set Panini did in 2012-13- 200 cards, all Kobe. Worth noting that it is 100 more cards than all of NASCAR gets in any set since 2007. Tony Stewart, 26 cards. Tony's off track issues did not adversely affect his card totals. Kevin Harvick, 23 cards. I suspect he will get included in all of Press Pass's subsets and inserts, being the Champion will do that for you. 3-way tie. Carl Edwards, Jimmie Johnson, Kasey Kahne. 22 cards each. I am actually surprised Jimmie is so low (relatively speaking). Since 2004 or so he has ranked third in cards issued. Mark Martin, 19 cards. Mark, surprisingly, ranks second all time in cards issued. It looks like he may have actually truly retired, so his card issues will likely go down. Tie, Danica Patrick and Joey Logano, 17 cards. Logano won 5 races and finished 4th in points. Danica didn't crack the top 5 in even a single race, and finished in the low 20s in points. Yet she gets more cards issued than Joey does on a regular basis, as Joey rarely gets included in insert sets and subsets. 3-way tie: Austin Dillon, Paul Pierce, Chris Paul, 15 cards each. It takes this long to get more NBA players. I was surprised to see Austin Dillon this high, but I do have a knack for pulling inserts of him. (One of my favorite cards of the year is a piece of tire off his Eldora winning truck I pulled from a pack of Total Memorabilia). Paul Pierce is ageless. He also is helped by the fact that I have pulled multiple parallels of his cards this year. Tie: Jeff Burton and Richard Petty, 14 cards each. Burton is also mostly done driving, and Richard Petty retired at the conclusion of 1992. It's good to be the King. He is helped by the fact that during the month of December I was able to trade for 6 cards from the 1992 Food Lion Richard Petty set, almost half the amount of cards of his I've added in 2014. 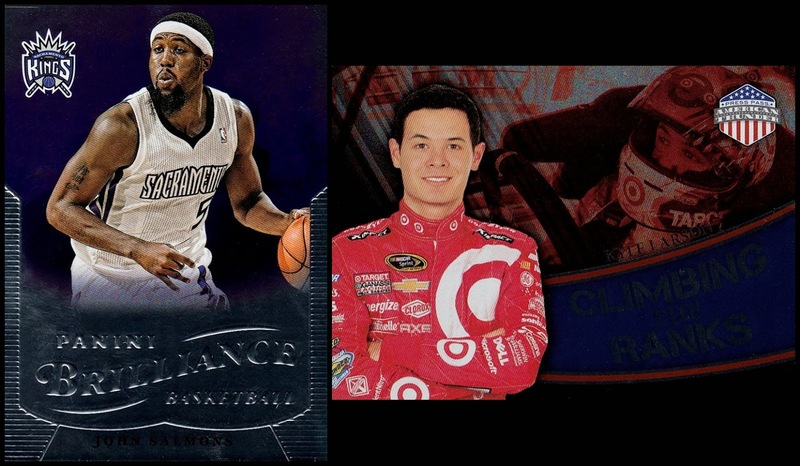 My favorite NBA player, Elton Brand, only saw 11 new cards added to my collection this year (in a tie with Bobby Labonte, Brad Keselowski and Carmelo Anthony). 5 were relics, 2 were Set 1sts, and one of them was a patch serially numbered 01/25. So while there may not have been a lot of new additions, they were good ones. 2003-04 Topps 1st Edition 8/13/14 Despite the Database listing this as an insert to 2003-04 Topps, it was actually a standalone set. 1922 Lambert & Butler's Motor Cars 9/28/14. My oldest completed set by 49 years, my first completed Tobacco card era set. In fact, my 3rd through 27th tobacco card in total. 2007 Press Pass 12/8/14. Of the last 6 sets I completed during 2014, 4 of them were completed through trades and 2 saw the last card I needed arrive to me as a Random Act of Kindness. 8 NBA sets, 8 NASCAR sets, 3 non-sports sets and one Olympic set...not too bad at all! It's my second-best year for set completion, trailing only 2004, when I completed 23 sets, although there are 30 sets in my collection that I've completed, and did not record a date for. (I just got out my paper listings and made an excel chart to figure this out) If I didn't miss any, it brings my completed set total up to 144. I completed 17 in 2013, so if I can stay on that pace, I should hit 150 in 2015. The years before 2013 were not so good, and in fact I did not complete a single set in 2011, or 2008. Only 6 each in 2010 and 2012. I hope it stays more like 2013 and 2014 than earlier. I have a few sets I'm close on, so maybe I will be able to knock them off in 2015, and with sets getting smaller and smaller (NOT a good thing) in theory it should make them easier to complete. There were some highlights on the year, as well. I did a handful of boxes- 2014 Topps US Olympic Team, 2012-13 Panini Brilliance, 2012-13 Past & Present, 2013-14 Panini, 2014-15 Hoops, 1995 Traks 5th Anniversary, 2013 Showcase (which was the subject of one of my first posts on this blog) and 2014-15 Prestige Premium, which I got for Christmas from my Mom, a huge surprise for me. I also secured a box of 1992 Pacific World War II but am moving through it slowly, to prolong the fun. I hit two major milestones in 2014- on February 14th, I hit 75,000 different NBA cards, which came, totally coincidentally, 18 years to the day after my mom gave me the pack of 1995-96 Fleer Series II that got me started with the NBA side of the hobby. On May 24th, my NASCAR collection hit 25,000 different cards, from my very first pack of 2014 American Thunder. Kyle Larson, who would be 2014 Rookie of the Year, ended up being my 25,000th card. Both cards are mirror foil and therefor do not scan well at all. I later hit 76,000 NBA cards, and am currently 40 away from 77,000- which I will hit tomorrow, on January 1st, using some of my unopened stash that I save for when I just need some new cards. On June 21st, a friend who wishes to remain anonymous sent me a huge box of cards, and that is where just about all my baseball, football and hockey cards came from, as well as some NBA and non-sports. I added 610 new cards to my collection that day, and I still have hundreds of cards saved to look at when I need a "pick me up". He still sends me random cards he doesn't want anymore periodically, that's a true friend. Two of my top 10 set additions on the year came from that one box, and had I gone through all the cards that day, I have no doubt that there were over 1000 cards in the box. Another highlight is already the topic of one of my blog posts, when I got 22 new sets for my collection in one day. I won't say much about it here, just look in the archive. In the week between Christmas and New Year's 2013, I sorted my entire NBA collection that I could find; it was the first time I had seen the majority of the cards since 2004, the last time I sorted my collection. I separated out the 1995-96 season cards, and all the sets I had completed up to that time. I then worked on them mostly, and finally finished posting my completed sets to the Database in August. Getting my completed sets done was a highlight of the year for me. I also scanned and processed all of my autographs, relics and serially numbered NBA cards, but I have not gotten them posted yet. In January, I finally made up paper listings and got an accurate count of my college basketball cards. I had been putting it off for years, I've never been a big fan of college cards. Later in the year, I don't remember when exactly, I finished making a paper listing and getting a count of my multi-sport sets. Starting this very blog in November is also a highlight on the year. I had attempted to create one in the past, but the system didn't support photos, or at least, I couldn't figure out how to add them, so I didn't get very far. I tried to attach the Excel file that so much of this post was based off of, but I couldn't figure out how. I was able to take a screencap of it so I can at least show it off somewhat. Strangely, the screencap didn't capture the colors of the red or pink used. But by sorting the chart through the various columns, I was able to take the numbers it gave me and create this post. I do have some goals for 2015. I want to finish my Tradelist. In late November and early December, I typed in most of my NASCAR tradelist to the tradelist feature on the Trading Card Database. My NASCAR tradelist to date. It is searchable by person or set. I finished less than a month ago and I've already used it to make multiple trades that brought over 300 cards to my collection. I have a few hundred NASCAR cards that I've gotten over the past three years or so that weren't sorted with the rest of my tradelist, and then I've got the NBA cards. My NBA duplicate stash once totaled over 10,000 cards in and of itself, although I have traded or given away several thousand of them. (I should note that I only trade duplicates- no exceptions. In 27 years in the hobby I've only ever traded away one card, in 1996, and it haunts me to this day) Right now it's probably about 5000 cards strong, although some are so deep in storage I may never see them again. (lol) You tend to accumulate a lot of duplicates when your favorite way to add cards is by the 600 count box for $20 a semi-local card shop offers. And when you only go to the shop when you've saved up enough money to get 5 or more of them. (In fact, it's one of those I'm going to be opening tomorrow to hit 77,000 that I've mentioned above!) Back in the day these boxes cost a lot less, and there were more sources of them, too. When you have a collection as large as mine is, you tend to get more duplicates than new cards. In fact, when I purchase the clamshell hanger of 100 cards at Target, I am happy if I get more than 5 new cards. Earlier in 2014 my brother got me one that had 26 new cards in it. I have not had that happen since the 1990s. The next one I bought myself had only 2 new cards. Go figure, right? But I digress. Another goal for 2015 is to get my card backs to card fronts ratio on the Database a little closer together, or perhaps even. When I first joined the Database in 2012, I had already scanned the fronts of many of my cards, including my entire NASCAR collection. I started posting them then. Within a month or two I decided to do it right, and scan the backs as well. By then I had already posted over 1000 fronts only, and I've been slowly chipping away at the margin, where I've got it roughly 350 cards apart at the moment. I need to make this a priority, but it gets slowed down because back then I would accept close enough, instead of the perfection I demand from myself these days. Cards would be crooked, parts of the card missing front the scan, all kinds of scanner scuzz not removed with PhotoScape, and more. It's so bad I've even thought about chucking all the scans I made in 2009-2012 and starting over. I had a third goal for 2015 and now I can't remember what it is. I am sure it will come to me at some point. As always, thanks for reading, and onward to 2015! For Christmas this year I gave my family a list of people and sets not in my collection, and I got lots of cards of people who it was my 1st card of them! I got 8 relics, several of which I pulled. Note that several of the cards appear on the 1st list as well. I got 7 autographs, 4 of which came from the Prestige Premium box. Two of the autographs are also my first card of the person- and the Daniel Suarez card appears on all three groupings! It's only the third autographed relic in my NASCAR card collection. One thing notable in the above photos- I used two different scanners to get the images. (One scanner cannot handle any amount of depth, which the relics from Press Pass all have- but does most everything else better). Since my settings I used to make these collages is set on "Maintain original size", it makes some of the cards look bigger than they should be. All but two of the cards are standard size- the 1948 Bowman card is smaller, and the 1995 Optima card is the "Tall Boy" style popularized by Topps, although this one is from Press Pass. I have a hard time picking favorites - I love all my cards- but the Darrell Wallace Jr. auto may be my favorite of the new cards. I've been following his career since he was 16, and I believe he will be a Cup champion someday, if he gets the right opportunity. Getting a 1948 Bowman card is always special. This is my 7th, and the first one I've ever received as a gift. It was the first basketball set ever released. The NBA hadn't even been formed yet when this card was issued. The green around the edges is the green construction paper I put behind most cards to scan. 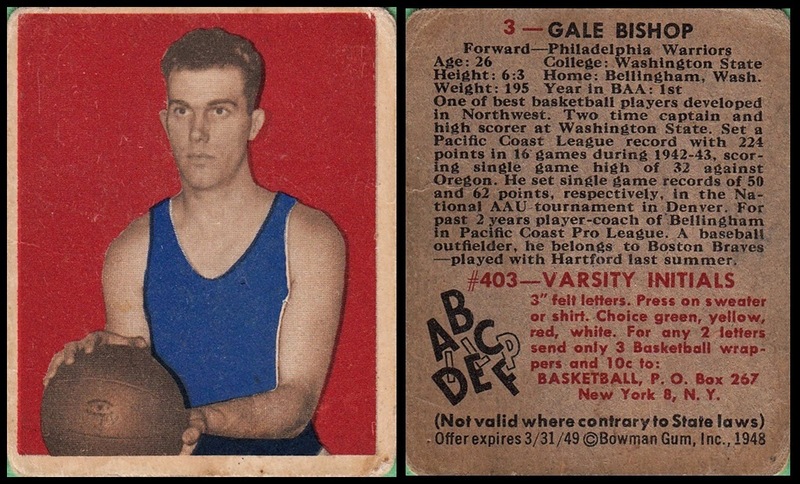 It was the only card ever issued of Gale Bishop. 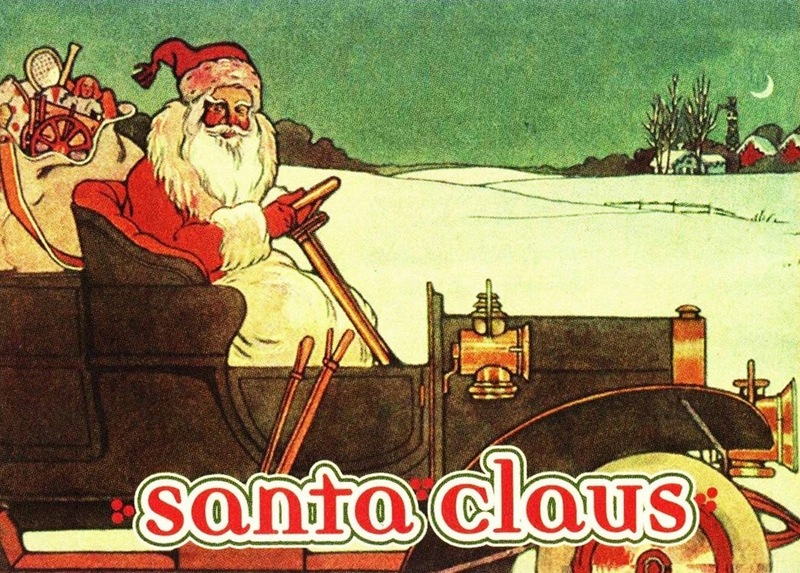 I've created a List on the Trading Card Database documenting all 243 cards I got for Christmas, and you can see it here: Cards I got for Christmas 2014 List unless I am updating it, in which case it is not visible until I finish for that session. I only have 69 of the cards posted so far, so I still have some updating to do. I would have been farther along but I hurt my back badly on the 26th- I have a bad back and have pain 24/7, but I hurt it really bad somehow and have not really been able to do much, including sit at my computer. The crazy thing is that it started hurting when I put my foot down moving a box with only a handful of magazines, and nothing more, off my scanner to start scanning my new additions. Trading Cards for Christmas = Great memories! As I type this, it's 4:30 PM on Christmas Eve, 2014. I have not really found the Christmas Spirit this season, even the gifts I'm giving aren't up to my usual standard- hopefully my family still likes them. But I've been thinking of past Christmases, and how my family has kept the card-related presents coming through the years. My family always gets me cards- that's a given. They know what I collect, they know what I like to get, and I've even given them lists of things I'd like. This year I gave them a list of both people and sets missing from my collection. My "thing" is having as many different people and sets represented in my collection as possible. (Knowing that completing sets, what I really love to do, is prohibitively expensive, and I will never complete most of them) Between my two sports, I'm short "only" about 1000 people and 100 sets. I don't expect to get them all tomorrow, but I hope that I get at least a couple of them. To be honest knocking all the sets out could probably be accomplished for under $25. The people would be harder, not only are there more of them, but some are rare- and old- the guys who only got cards in 48 Bowman are going to be expensive, and those who only had promos issued will be hard to find, let alone afford. But I digress. Most of the boxes I got were from the 1990s, my favorite era in the hobby, including both series of 1992-93 Skybox- a set I would complete at Christmas 2013! I keep detailed paper listings of my collection, and each different day that I get cards gets listed in a different color. That year, I burned through an entire pen listing my new cards! It was my favorite green ink. Each set has a listing, where I write all the numbers, and as I get the cards, I write in the subject and the date I got it. I have a collection of more than 50 different ink colors that I use. Each insert also gets a color, regardless of the date. That's another Christmas memory. I began my paper listing at Christmas 1998. I had made an attempt to start it earlier in 1998, but it didn't take- the one problem and the reason that idea failed, is that I listed only the cards I had, and did not leave space for the cards I was missing. As soon as I got a new one, which likely happened quickly after I finished the listing, it was for 1998 Maxx 10th Anniversary, one of my all time favorite NASCAR card sets. I still have that listing. although I've recreated it in the format I use for the rest of my collection. It was also created on wide rule paper, everything else is in college rule. Christmas 1998, I received a box of 1998-99 Ultra, and that was the first I listed where I left the numbers for cards I didn't have empty, for future filling in as I got the cards. (I have not actually finished the set yet, either). My listing has evolved some over time, and it's actually my favorite part of the hobby. When I was away from the hobby for most of 2007 and 2008, and the NBA until 2011, THAT was what I missed the most, in fact. The biggest difference is that for that set, the Gold Medallion parallels, instead of writing Gold Medallion to the right of the player's name, I used a gold metallic pen to over-write the number, and a silver pen for the one Platinum Medallion card I pulled. I shortly moved parallels to the wide open space to the right of the player's name, but it would take me over a decade to decide to line up the parallels, instead of just writing them in whatever order I got them, left to right. For sets with multiple parallels it made my listing very confusion. I didn't start keeping the actual date I got the cards until late 1999, around September. I have not always kept up with that, unfortunately. My biggest regret in the hobby is not only not documenting sooner, but not fully documenting everything, even as late as 2013. Unfortunately, my record of new cards added on Christmas day begins only with 2002. I've been collecting since 1988, so the records are very much incomplete. I do have records for cards for 10 years' worth of Christmases, and 2002 is the leader, as noted, with 1208 new cards. 2013, last year, saw me get 810 new cards, which of all the documented days in my collection, ranks 5th all-time. (I did boxes of Galactic Files 2, 1997 Maxx, 1999 Wheels High Gear, 1991-92 Skybox Series 2, 2012-13 Hoops Retail, 1995 Upper Deck 2 retail, and several blasters, and more. It is the only year I have a photo for. Next comes 2003, which saw me get 649 new cards. 2012 saw a renaissaince for me as I got back into the NBA in a big way after taking a break in 2007. (Something else I now regret!) and saw me add 583 new cards. 2009 saw me get 170 documented cards. 2011 was 103. Almost all of them came from the Wheels Main Event box. 2005 was a scant 19. I don't have any documented for 2007 or 2008 at all. I know I got at least 13 cards each of those years, because I always got the NASCAR yearbook for Christmas, until they switched away from UMI and refused to fill our orders. Both years came with 13 card promo sets, but did I get other cards? I don't know. And that drives me nuts. That is why my main goal in 2014, and I mostly accomplished it- was to fully document every card I got. Not knowing was so very frustrating. I only forgot to include 5 cards that I am aware of- all issued with Racing Champions diecast replicas- but I've written them in the margins. What will 2014 bring? 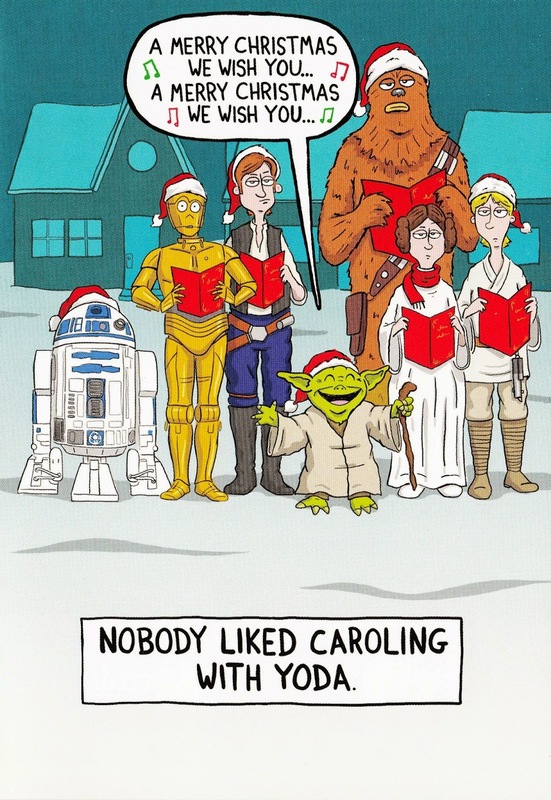 I don't know yet, but knowing my family, they got me cards, and I shall hopefully be making a post about Christmas 2014 in the next day or two- I may not have time tomorrow. 22 New Sets added to my collection in one day- a new record! While I am a set builder primarily, I know that there are many sets that are too rare or too expensive for me to ever have any hope of completing without winning the lottery, but getting at least one example from as many different sets as possible is much more within reach. Usually I can only get one or two at a time, sometimes 5 or so. But this past weekend, I got 22 new sets in one day, by far my personal record! It could only come in non-sports. There aren't that many NASCAR sets not yet in my collection, and the NBA sets I'm missing, while larger in scope than 22, tend to be the high-end, expensive sets, so it is highly unlikely that I could get 22 of them in one day. But non-sports...the world of non-sports cards is various and expansive. There are literally thousands of sets, covering just about as many topics, and a rich history that goes back to 1879 in the USA, possibly earlier in Europe. (My oldest is, I believe, 1910, but I one of the 22 I got this day may be older...read on). Unlike the NBA and NASCAR, I don't know much about non-sports cards, comparatively. There are some areas I'm fairly knowledgeable on, like Star Wars and DC Comics. But other areas I know very little about, even subjects like history and automotive, there are so many sets that I've simply never seen or even heard of, and then there's the estoric stuff, that I love but know even less about. 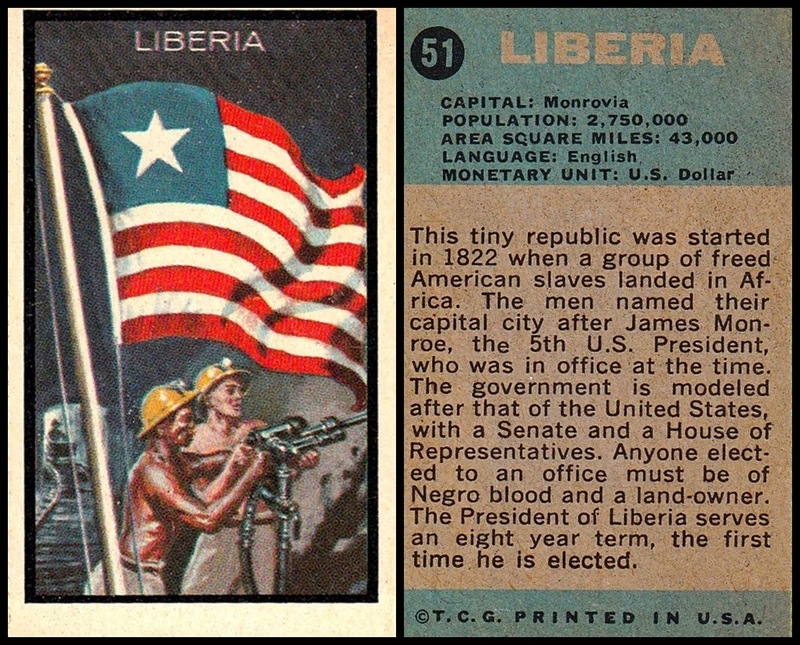 And that doesn't even take into account the vintage issues, the cigarette card era, etc. The more I learn, the more I enjoy, and there is more I don't know than what I do. But I love learning about them, and the best way is to add those cards to my collection! I will show each of the 22 sets, and start with the ones I need help with. This one is the one that intrigues me the most. It's clearly very old, but I don't know how old. The texture of the card tells me that it's 1920s or older. I don't know what exactly is going on on the card front, or what it says. I see a small 1883 at the very bottom, but I don't think that is the copyright, I think that it is actually part of the coat of arms of the company that issued the card. But I could be wrong...I really have no clue. 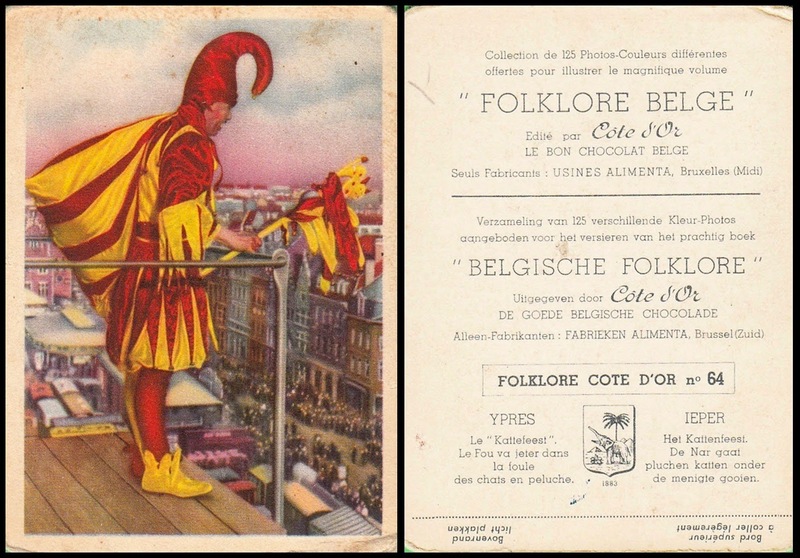 Also, the front and back of the card are 180°, which is highly unusual...although perhaps not in Belgium? I got 8 of the cards from this next set, which is quite clearly from Germany. The subject is military history, and while all the cards I got are WWI topics, the dealer had others as well. None cover WWII or later. 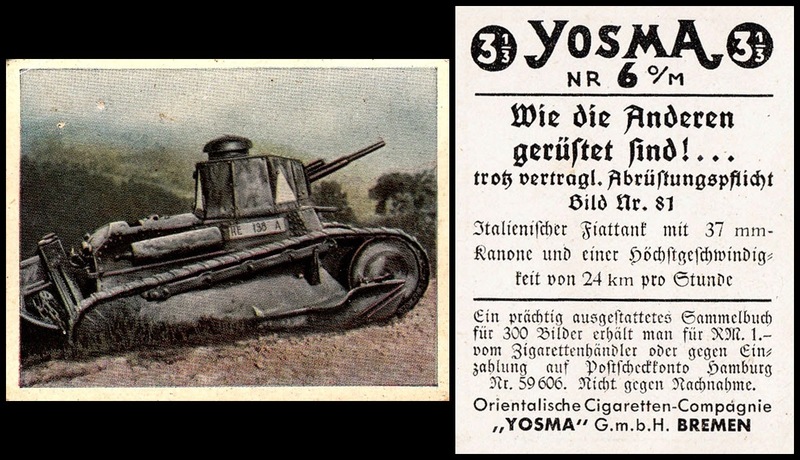 I know cards were quite popular in Germany before WWII, and I wonder if these date to that time? I have no clue, but I'd love to find out. I got cards numbered as high as 264. They are small, and very flimsy. The writing style looks old but I don't know if it really is. Some are yellowed, some are not. I don't know what country it was issued in, when it was issued, or the while checklist. This set is from 1976, and I have it tentatively labeled "Car Fax" but I don't know more than that. The dealer had others from the set but this is the only one that was even marginally interesting. Now, we get into the sets I can ID. 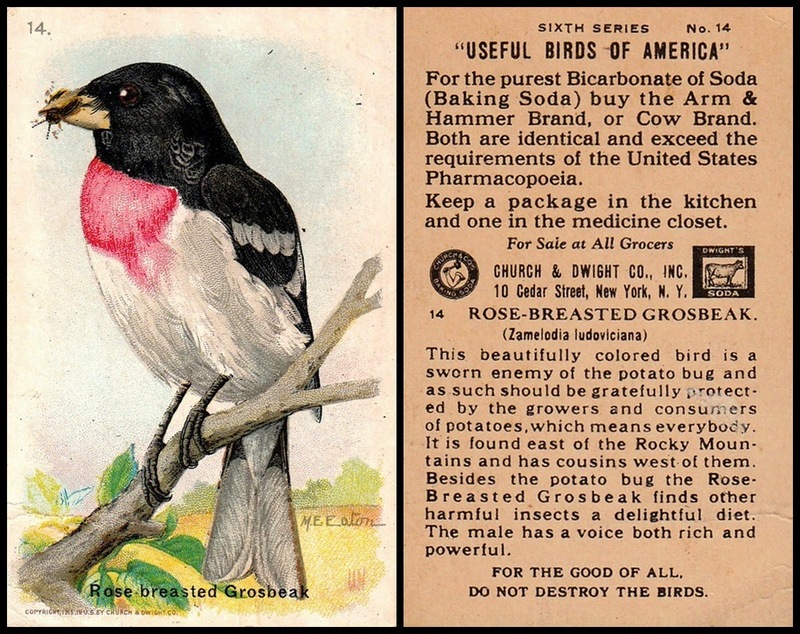 Pre-War, Arm & Hammer issued cards, including 10 series of Useful Birds of America, between 1915 and 1938. This is my first from any of the series. Series Six was issued in 1933. Considering how few early cards I have, quite surprisingly this is not my first set from 1933! 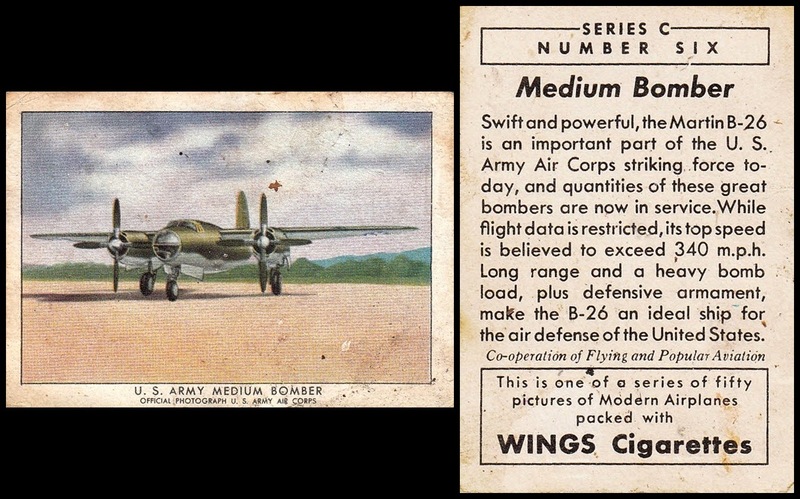 Next up comes Wings Series C. Wings Cigarettes issued several sets of plane cards, two in 1940, one in 1941 and this series, from 1942. They all use the same design. I have cards now from 3 of the four sets, missing only 1940 Series A. This is a large set, 180 cards. There were several sets issued of automotive license plates, mostly in the 1930s. This set was issued by Topps in 1950, and I got two of them. 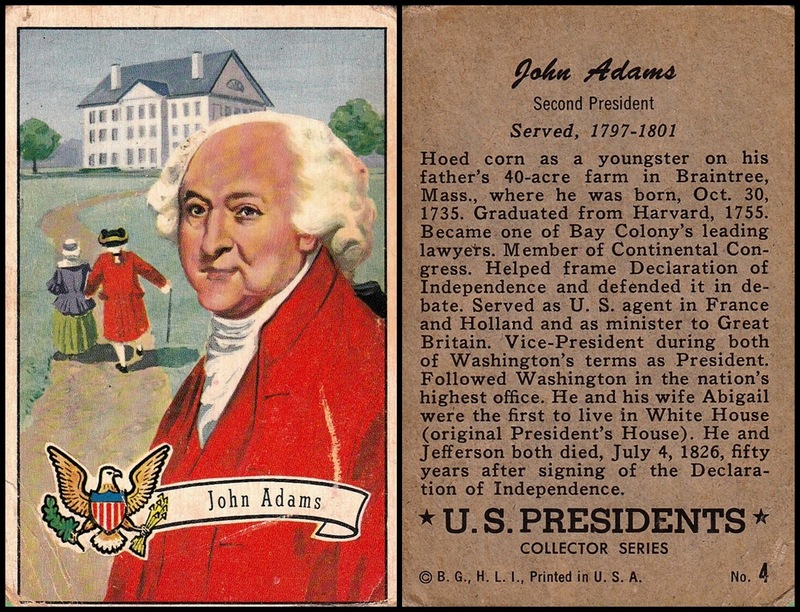 The presidents of the US are popular card subjects, although more in the past than today. Bowman issued this set of 36 cards in 1952, and I got 19 of them! They are mostly all in poor shape, but they are mine, and that's all that matters! The third and final Bowman set, from 1954, is US Navy Victories. This was a 48 card set, but I only got this one. For a long time I've wanted the Topps Flags set from 1957...and this isn't that one. But it's close! Actually, I didn't know this one existed until I added them to my collection. I got 6 of them. From what I've gathered, it's from 1963 and called Flags Midgees. I have not been able to find a full checklist yet. Brooke Bond is still issuing cards in the vintage style, or at least they were until recently. I had never heard of them until I saw some getting posted to the Database, but they do a wide range of mostly historical subjects. I hadn't had any, but I got two sets this weekend- and as it turned out, both were issued in 1969. 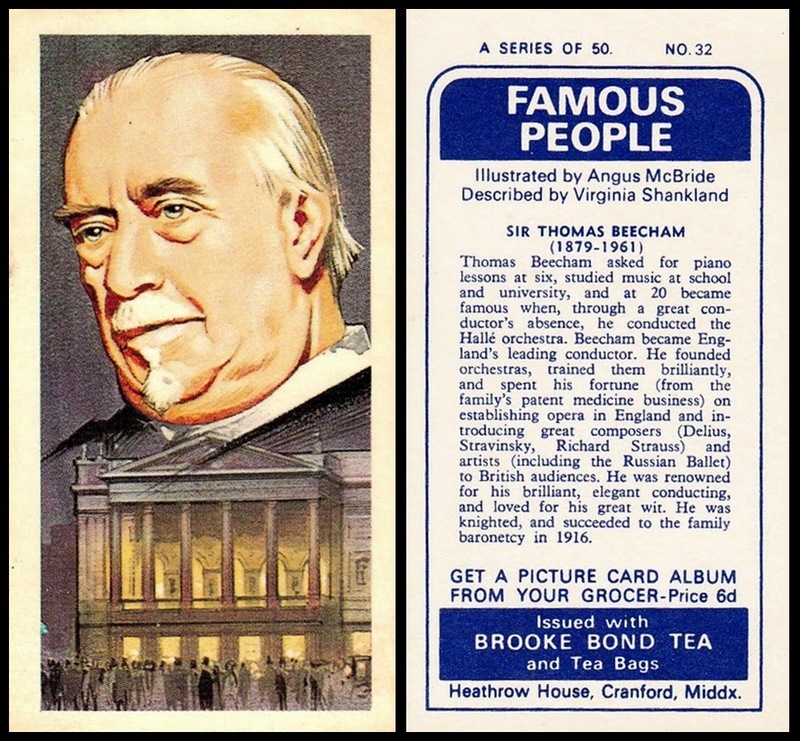 This one is a 50 card set of various famous people, although to be honest, I hadn't heard of this person before I got the card. 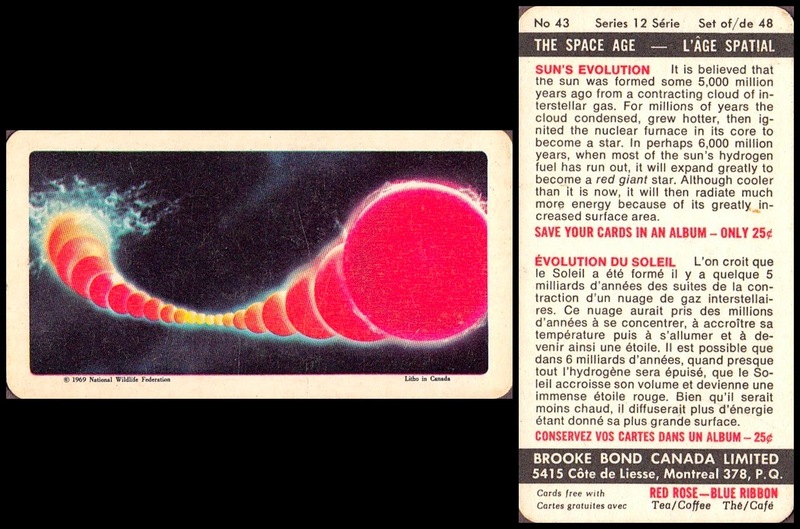 In 1969, Man reached the Moon for the first time, and Topps created a set to memorialize that. I got two of them. 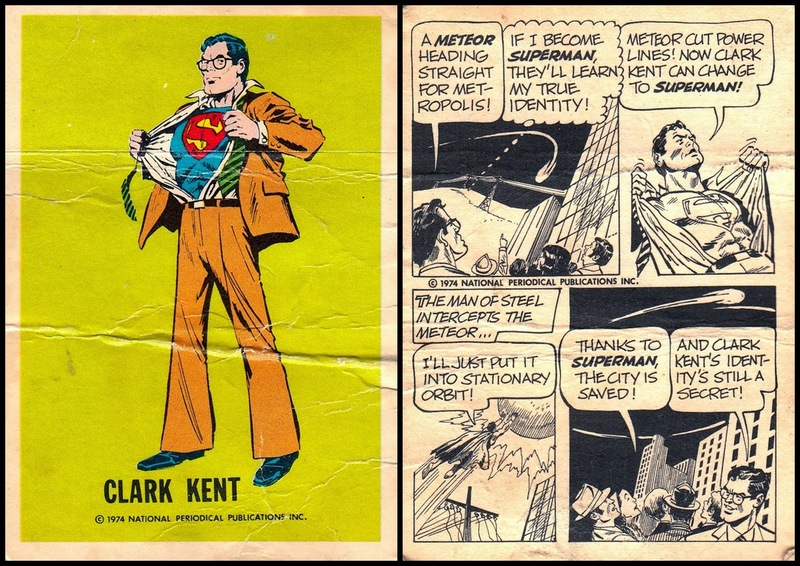 In 1974, Wonder Bread issued a set that was half DC Comics, half Warner Brothers cartoons. I got two of the DC half of the set...both are in poor shape. John Player and Sons is a tobacco company from Great Britain. They sponsored F1 teams and issued cards. I don't know if they still do, this set is from 1975. A Marvel set, from 1975. Art by Jack Kirby, or a copy of his. 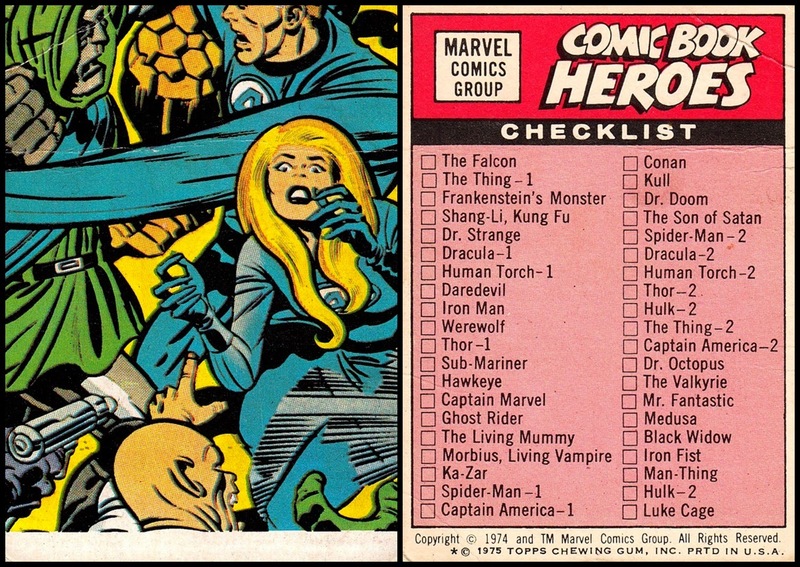 I'm not really a Marvel fan, I grew up a DC fan, but I still have several hundred of their cards....and will pick up random cards from their sets if they are cheap enough...all of them in this rundown cost me under $1. 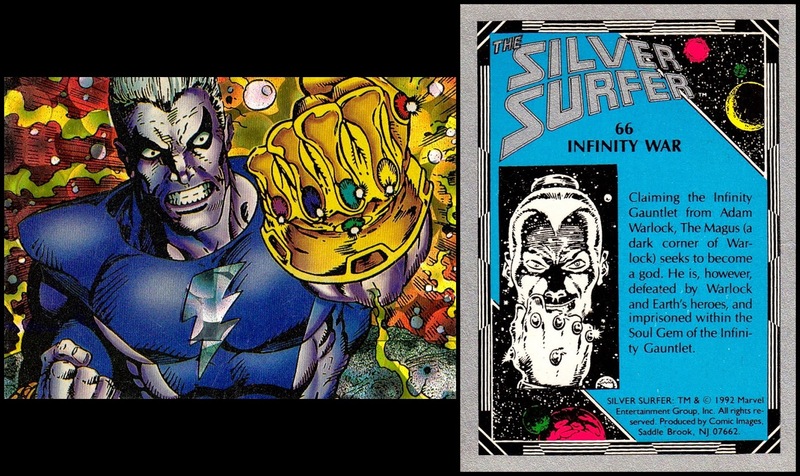 Oddly I missed the 1991 Marvel Universe set when it was new....I have a complete 1990 set, I have some from 1992 and 1993, and I'm 6 cards away from the complete 1994 set...but no 1991. Now I have two! An automotive set from 1991. I don't know the checklist, meaning how many or what they are. I'd like to. Another Marvel set, from 1992. The card is actually is printed on a form of foil stock. Had to censor this one before I could post it based on the Terms of Service, lol. And last but not least, a set for Popeye...My favorite classic cartoon. I didn't know Popeye had cards issued, even though I was very much active in the hobby in 1994, until 2012. I am not sure if this is an insert or promo. I need to do more research! The blue border on both front and back is the same color, but I didn't edit it properly. And that ends my rundown of my new additions. I hope you enjoyed seeing them as much as I enjoyed adding them to my collection! 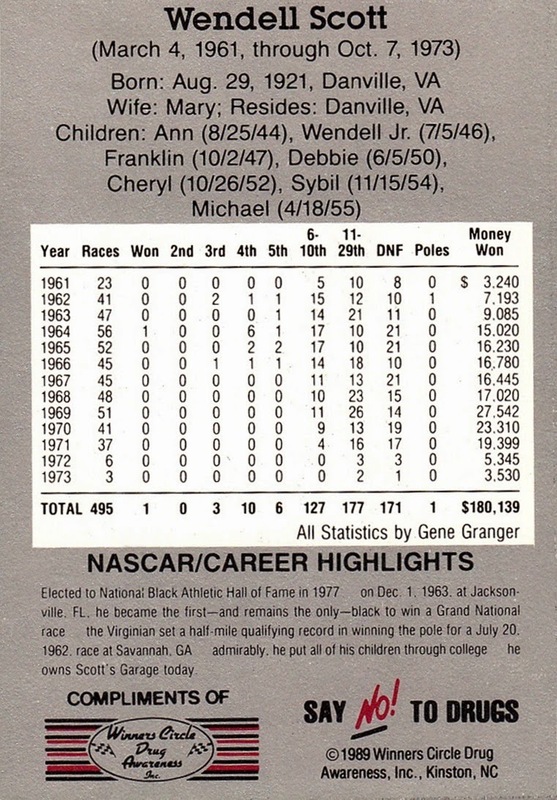 1989 Winners Circle Wendell Scott - I have recieved my #1 Most Wanted card! Today, I received in the mail my #1 most wanted card. It has never been easy for me to determine what my most wanted card has been- there are simply too many to choose from! (I want them all, honestly...not to sound greedy but it leaves me plenty of options and never a disappointment). But since I found out this one existed, in 2009, it has been atop my list. The set was #1 on my most wanted sets list as well. Wendell Scott is an inspiration to me. He had to fight harder than anyone else in the sport to succeed, and he did just that. A lot of people will say "He only has one win"...and the answer to that is, it's awfully hard to win races when they won't let you into the track grounds for the sole reason of skin color. I can't even begin to comprehend the terrible things he and his family endured, while he was just trying to chase his dream. There is no doubt in my mind that he would have won many races if he had the same opportunities as the other drivers. And it's not like he only won one race. He only won one Grand National race, but NASCAR is more than just the GN (now Cup) series. When you consider the other series, he won multiple championships...in the 1950s...in the South...against entirely white competition. Think about that for a moment...and what an incredible accomplishment it was, and still is, today. I'm not totally convinced he didn't win more than one GN race, but just didn't get the credit for it. Unfortunately, his career came to an early end in 1973 due to injuries he suffered in a massive wreck at Talladega. He had passed something like 19 cars in one lap, but somebody wrecked in front of him and the track was blocked by many wrecking cars; he was not able to avoid it, as half the field was taken out, but he suffered series injuries in the wreck, racing less than 10 times after that accident. He owned an auto mechanic shop for the rest of his life, but he sadly lost his battle with cancer in 1990. This is the ONLY card issued during his lifetime to show him. He also had a card included in 1989 Maxx which showed his car. He has, by my calculations, 48 cards issued of him or his car, several of which picture him with his family, who were also his crew. Of those, I now have 39 of them in my collection. By far he leads my collection by percentage. 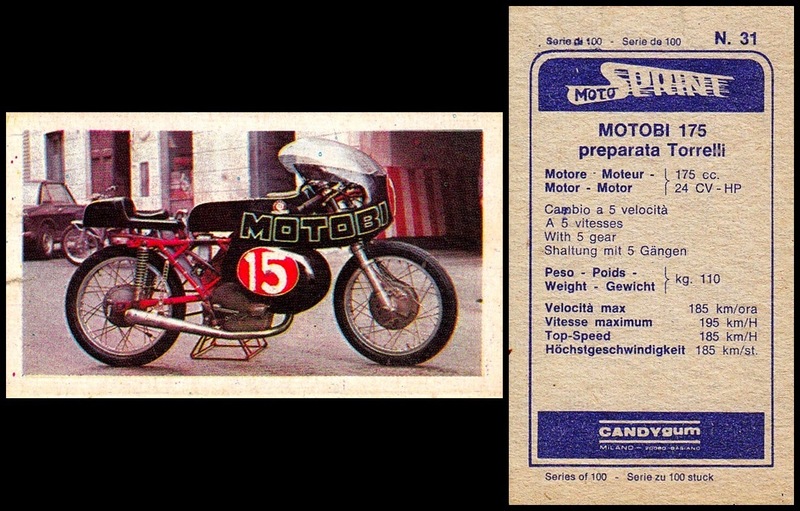 I am missing only the 6 card set issued for him in 1991 by TG Racing, the promo issued by K&N Racing for their 1991 set of him, the promo issued by TG Racing for their Masters of Racing Factory Set reissue in 1992, and the 1994 VIP base card, which is the last card ever issued of him. (Press Pass didn't include him in ANY of their Legends releases, in fact the 1994 VIP card is the only one Press Pass ever issued of him). I do have an uncut sheet of the K&N Promo card, but I don't have an actual copy of the card. These all rank very high on my wantlist, and eventually I will determine a new #1 most wanted- it may well be one of these I mention as not having, or one I don't even know about yet. The 1989 Winner's Circle set was issued as a promo in schools, I believe. They are not super-rare but they are not common by any means. The set is composed entirely of Legendary drivers, two of which have their only cards issued in this set, Ethel Flock Mobley and Ralph Ligouri. There is a variation on the Lee Petty card which is incredibly rare. I learned of the set's existence in 2009, and it instantly became my #1 most wanted set. 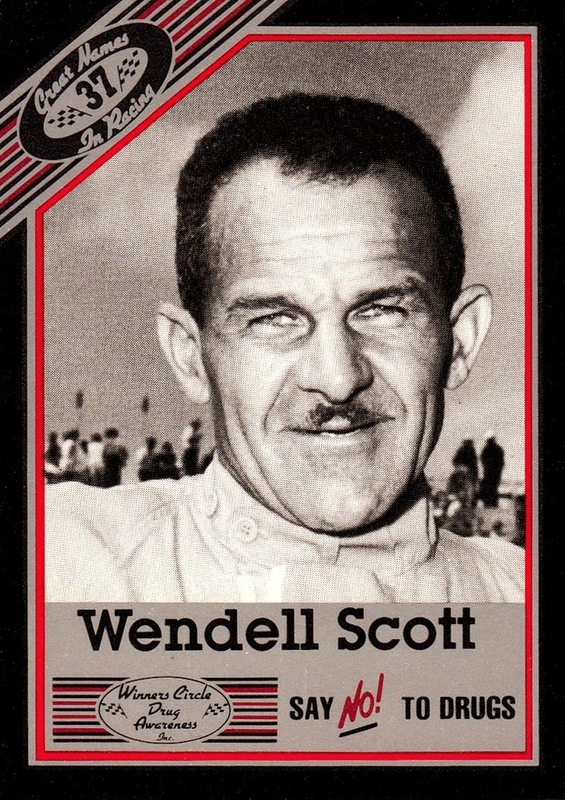 Today, December 12th, 2014, I now have not only Wendell Scott's card from this set, I also received Cotton Owens' card as well- both as another RAOK from a NUTS member. Although this is not card related, it is something I am very proud of. Back in either 2009 or 2010, I discovered that there was not a single page on Facebook to honor Mr. Scott, so I took it upon myself to create one. It has turned out to be one of the most rewarding experiences of my life. I believe we played a large role in his winning the Fan Vote and getting elected to the NASCAR Hall of Fame, as it brought together his many fans and I made sure that the voting location was very easy to find. Even more rewarding are the friendships I've made because of the group, including with his children Wendell Scott Jr. and Sibil Scott and his grandson Warrick Scott, as well as several others like myself who are fans of his and all around good people, Britt, Leon, Floyd, Jay and more...thank you! If you wish to join the group, or even just read the posts, you can find it HERE. As of this writing we have 1,235 members. It's been a while since I posted, but I have been working on a project I've been putting off for a few years, and that is posting my duplicates to my tradelist on the Database. It took a long time, because I have nearly 10,000 duplicates...more than some people's collections. (I have been very lucky to build a great collection). The cards I went through are just the ones I typed into my Excel file years ago- 2012 I think. (based on the fact that the last thing typed in was early 2012 cards). But it was frustrating, because so many cards were damaged- nearly if not equal to what wasn't damaged. I did get the majority of them second or third hand (or more) and it seems most people don't really care enough to treat their cards well. Many had bad corners, many had scratches, most had both. Some had water damage, creases, or some combination of all the above. I now have three boxes of cards I deem untradeable. The cards entered into the Tradelist on the Database are cards that are in excellent shape- cards that you wouldn't need to look for a replacement for, like the just came out of a pack. It was frustrating work, but not without rewards. I discovered at least 5 variations that I didn't realize I had both of. Possibly more, I won't know until I get my collection out and cross check them. I scanned the fronts in 2009-10 but many of the variations are on the back. 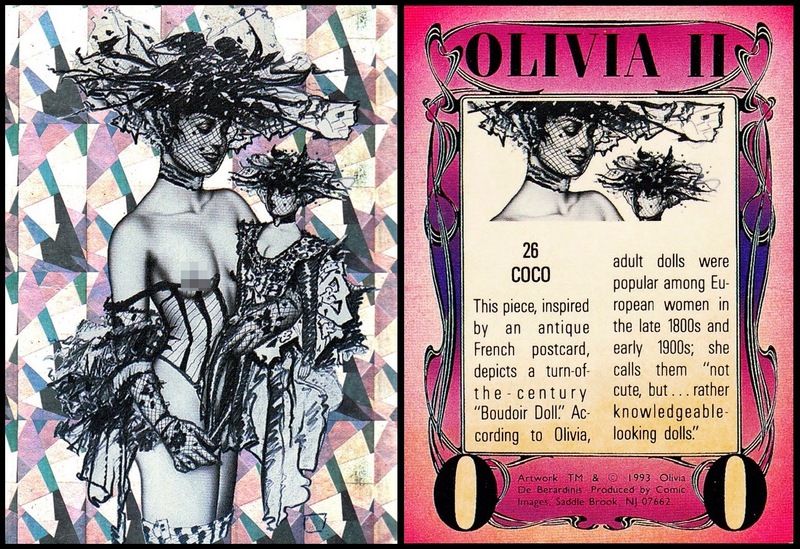 My paper listings, which I will detail in time, only show me if I have an example of the card- there is usually no way for me to know if there are variations, let alone which one I have, unless I get both at the same time, which has happened. here are two examples of variations that I discovered in my duplicates stash, in both cases the corrections (on the right) were in my duplicate stash, and the error was in my collection previously. 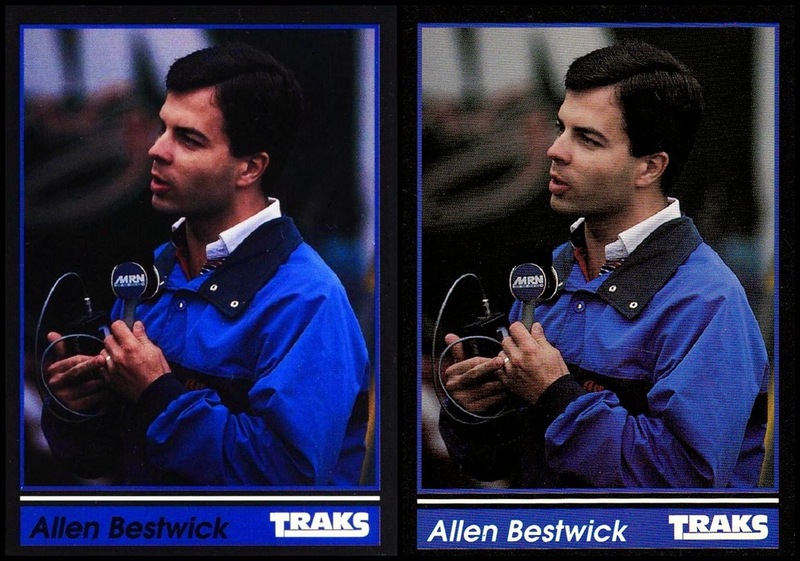 1991 Traks #134 Allen Bestwick. This set I believe has the most error and variations of any NASCAR set, with at least 11 different cards having at least 2 variations. The only difference is the color his name is written in. This one is a true error, more than the above, which is more of a variation. They misspelled Musgrave as "Mugrave" on the first print, and corrected it later. And then there's the main reason to maintain a tradelist...trading! I have made three trades, and have another proposed, all since my last post. Two are with the same person, and once the package arrives to me, I will have both sent and received more than 100 cards from this one person. That's a lot- I normally don't succeed in making many trades for a few reasons- mainly that I only trade duplicates, without exception, and I mostly do (Have and want) base cards, which a lot of people just simply can't be bothered with. But occasionally I'll meet someone who needs some of the cards I have, and a trade can be made. (I have over 100 completed trades on Trader's Retreat but none in years, and more than 25 on NUTS, the NASCAR exclusive trading board. These stats date back to back to 2003. The trades I made this month were on NUTS and the Database). 2007 Press Pass. A 120 card set, I got a box for Christmas but came up a few cards short. I acquired most of them over the years but came up one card short- #73, Jeff Gordon's car. 2012 Press Pass. A 100 card set, the standard for Press Pass for the past several years- too small to really cover the sport. I did this one mostly through retail. I had been 2 short. 2010 Eclipse...a 90 card set, I did this one the hard way- through retail and trading. Not a single card in this set came to me from a hobby pack. I really didn't care for the cards when they were introduced, but now I kind of like them. The canvas texture is unique and interesting. I had been 4 short. In the time since my last post, I also received two RAOK, or Random Acts of Kindness. The first was 9 cards from 2015 Press Pass Cup Chase, the hobby version. I would not have gotten any of these otherwise, as the hobby box is too expensive. I knew these were coming. Here is an example of the hobby card with the retail card, hobby on the left. The hobby version is foil and has a Cup Chase logo on the card front. I actually prefer the retail cards. The second RAOK was a big surprise, as I did not know it was coming- just a gift from a friend! While I got quite a few cards in the group, these three are my favorites, three short prints from 2009 Premium. They are printed with a really cool foil pattern which is not really captured in the scan. Now, the "Sort of Baseball" cards I mentioned...Topps usually includes some historical subjects in the Allen & Ginter release...so many that I've even debated purchasing some packs even though roughly 75% of the cards would be baseball players. I've added most of the historical subjects to my wantlist on the Database, and these three are the first I've added to my collection. Now, the question is, do I sort them with my small baseball collection, or with my non-sports collection? I have not decided yet. I'm open to input!